Lens manufacturer Tamron has announced it's developing a new telezoom lens intended for full-frame users, the 100-400mm F/4.5-6.3 Di VC USD (Model A035). At 1,115g, the new optic is said to be the lightest lens in its class – ie with this focal length and aperture combination – designed for full-frame DSLRs, and it makes use of magnesium in key areas of the barrel "to improve weight reduction, strength and portability". The optics include three Low Dispersion elements to help curb chromatic aberration, along with the familiar eBAND (Extended Bandwidth & Angular-Dependency) Coating to combat reflections and minimise ghosting and flare. The lens includes a high-speed Dual MPU (Micro-Processing Unit) control system, which is said to help to deliver fast and precise autofocus. The 'USD' suffix in the lens name make clear the presence of Tamron's Ultrasonic Silent Drive focusing motor, which has featured in many recent lenses. Tamron also states the Dual MPU ensures reliable image stabilisation, which is handled by Tamron's familiar Vibration Compensation (VC) unit. The optic has a minimum focusing distance of 1.5m, and a maximum magnification ratio of 1:3.6. 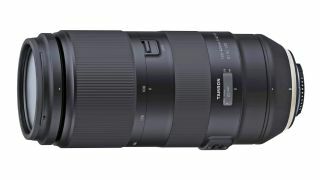 The image accompanying today's announcement also shows the barrel designed with a focus-distance window and Tamron's Zoom Lock mechanism, although the company states that specifications, appearances and other details may well change before the model is formally announced. For the benefit of those after a longer reach, Tamron has said that the optic will be fully compatible with the company's 1.4X teleconverter, the combination of which would bring its effective focal length to 140-560mm. Those wanting to use the lens in more challenging conditions, meanwhile, will be pleased to learn that Tamron has crafted the barrel to be resistant to moisture, and this has been complemented by a fluorine coating on the front element to provide an additional layer of protection. The lens is also set to work with the Tamron TAP-in Console, which allows users to adjust the autofocus and VC mechanisms among other things, while an Arca Swiss tripod mount will also be made available as an optional accessory. The company filed a patent for an optic of this focal length and aperture last year, although it has not confirmed any other details up until today. As of yet, there is no word on pricing or availability for the new lens. Although the company has not specified the mounts in which it be available, it has typically made its full-frame lenses compatible with Canon and Nikon DSLRs, as well as Sony's SLT line of full-frame cameras.